France Feudal. 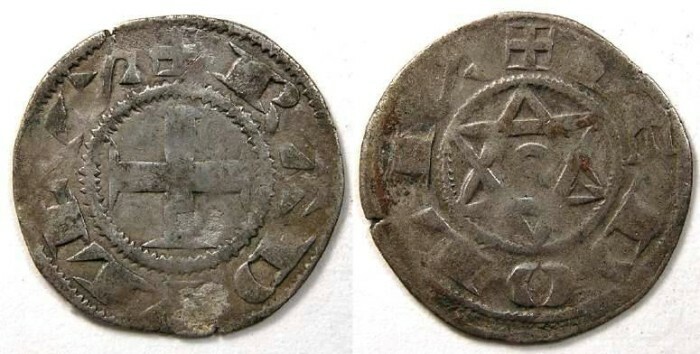 Deols, Raoul VII, AD 1160 to 1176. Silver denier. Roberts attributes this type with the side ways S to Raoul VII, AD 1160 to 1176, is not 100% certain. PdA attributes it as a general type for any of Raoul III to VI (AD 1040 to 1141), which interestingly does not include Raoul VII (but he does not include any coins for that King). For now, we have gone with Roberts attribution. Denomination : Silver Denier. Mint : Deols (Chateauroux). Size : 18.7 x 19.5 ;mm. Weight : 0.87 grams. Obverse : Short cross with RADVLFVS around. Reverse : Star of David with a circle in the middle, with DEDOLIS around (the S is turned sideways).